This could be an exciting chance to change your view on employment. 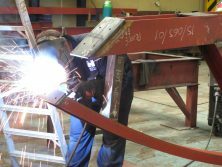 We have been advertising for Fabricator Welders and Welder Fabricators, experienced or skilled for some time now. If you have read our adverts before please bear with me. Don’t shut this opportunity down just because of the hourly rate offered. You could be just the person we have been looking for and we may be willing to pay exactly what you want to earn! We have a really friendly bunch of staff who enjoy a strict but relaxed working environment. The work is varied – you very rarely do the same job twice, look through our website to see what we produce. Rates are negotiable but I have to start somewhere and £12 seems to be the going rate. Tell me why you are worth more. We ask in return that you are reliable, can follow instructions and read fabrication drawings. We work at the factory and on site. Castle Welding is a family run business, not a faceless corporate, this may deter some, but to some it’s a chance to shine and make a difference. You have nothing to lose by applying.